Blessed to get together with my Nephew on his boat and enjoy some great fellowship, fishing, and weather. We started fishing about 8:30 with slight fog and calm waters. I was using Elgin Fishing God's Tooth spoons and he used his diamond flash spinners tipped with worm. We were both using the God's tooth prototype dodgers. Excited to mention as a side note that I am planning to have a limited amount of the dodgers available for our customers this year! I will post on our FB page, website, and a couple other sites when and where they can be purchased. 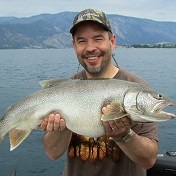 God blessed with 9 fish total which consisted of 8 cutts and 1 coho ( coho must be fin clipped and at least 12 inches). We thought we had our limit but miscounted by 1! Better to be short than over. Lots of midges rising and saw a crowd of birds near the middle of the lake. 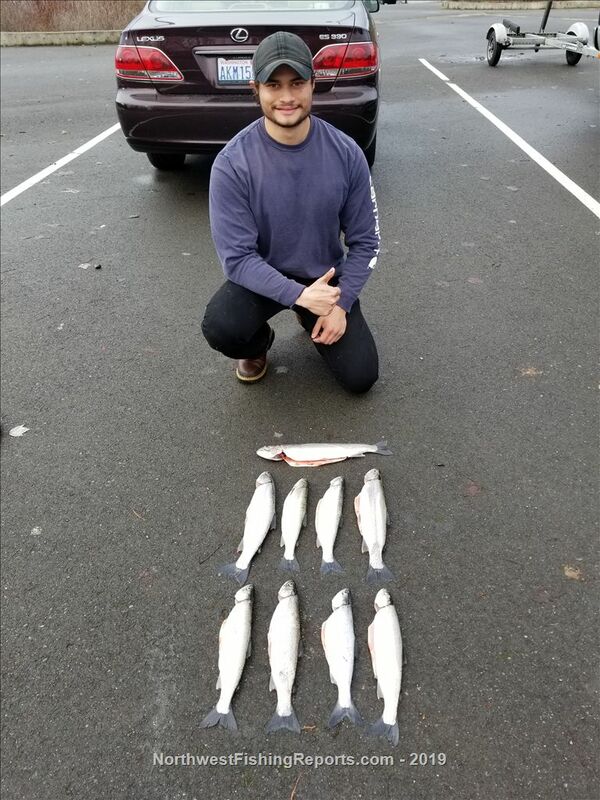 Most of our fish came at 20' with a couple of hookups at the surface. We trolled mainly about 1.5 mph and the barometric pressure was about 29.54. Fishing today was never red hot so we had to work for them. The fish were scattered in the water column and we never saw any large pods on the fish finder. We did have a period where the bite was off for maybe a couple of hours. Perseverance and changing presentations was helpful. We finished up about 2:00. Nice to see guide Paul Lewis out there as well! Captain Paul guided his clients to another day of limits! Can't recommend highly enough Fast Action Fishing Adventures to get you on the fish. Big kudos to my Nephew for getting us on the fish and an enjoyable time!!! The video below shows some of the action for the day and wishing all tight lines! Nice day guys! The dodgers are money, cant wait for the official release! Great day Russ! Glad you made it down this way to enjoy a fun fishery. If I can get down deep enough with a new fly line that I have coming I plan on using one of your spoons on it. What color would you suggest. I have about 5 colors. Thanks Bob! I recommend 50/50 blue, 50/50 gold, perch, pink, orange, silver shiner. Green seems to be really good sometimes and not so much other times. One I should have tried but didn't this time was brown trout. Happy New Year!! I bought a few of your God's tooth lures several months ago. They have been sitting unused in my tackle box. My partner and I were on Lake Sammamish yesterday mostly fishing during the afternoon hours. We gave them a try for the first time. We can attest to the fact they work well - - - in fact very well. 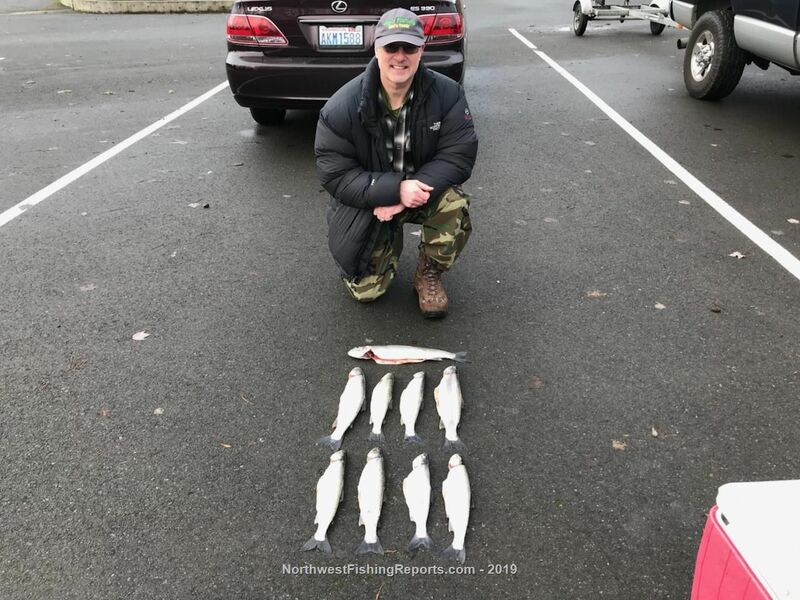 We caught and released 8 Cutts including 2 Coho and had a number of misses with the half/half silver and gold in 4 hours of fishing. It was by far the best outing on the lake we have had this winter season.